The Sonicare AirFloss is a handheld device that contains a reservoir of water or mouthwash. When activated the AirFloss fires a small burst of air mixed with the water or mouthwash into the user’s mouth in between the teeth. For those that do not like flossing with string, or find a countertop water flosser too messy, the AirFloss is worth strong consideration; the whole process of using it is effortless. This is then backed up by a good battery life. There are several model numbers for the Sonicare AirFloss, which vary depending on colour and number of nozzles included. We outline the differences later on in the review and link to various buying options. We’ve also looked at a range of water flosser options in our best water flosser article. Is the AirFloss a better way to floss? If you are anything like me, the thought of flossing is one that just makes you sigh. It is one of those jobs you know has to be done when cleaning your teeth, but we would all rather do without it. It takes time, it can be fiddly and it can hurt. It is one of those necessary evils in life, or so it seems. For a long time, I, probably like you, had been using string or tape floss. About a year ago though I discovered the wonder of the Wisdom Easy Flosser(view on Amazon) which I absolutely love and is my go to flossing solution. I was sold on the idea of the AirFloss after just a few days of use. It is not perfect, but if you really struggle to motivate yourself to floss, if this does not change your attitude, then I am not sure what will. What is the Philips Sonicare AirFloss? A handheld device that contains a reservoir of water or mouthwash. When activated the AirFloss fires a small burst of air mixed with the water or mouthwash into the user’s mouth in between the teeth. The mix of air and liquid fired in between teeth and along the gum line loosens and dislodges plaque, bacteria and residual food particles that normal brush cleaning might not manage to reach. Where normal flossing relies on the floss to touch, grab and wipe away such, the AirFloss relies on the liquid and air combination to do this via the pressure at which it passes by and touches the teeth and gums. Philips suggest that using this can remove up to 5 times more plaque than a manual brush and can improve gum health in just 2 weeks. The following video created by Philips shows just how to use the AirFloss, but it is very easy, there are just 3 simple steps. Use with water or a mouthwash like Philips Sonicare BreathRx. Hold down for continuous automatic bursts, or press and release for manual burst mode. Micro-droplets of air and liquid remove plaque between the interdental areas. Hopefully, the 3 key sections above explain how it works and you now know how it differs to what I call traditional flossing. I wish to now explain the AirFloss in a little more detail and tell you what is is really like to use on a day to day basis, but there is one additional subject to cover. 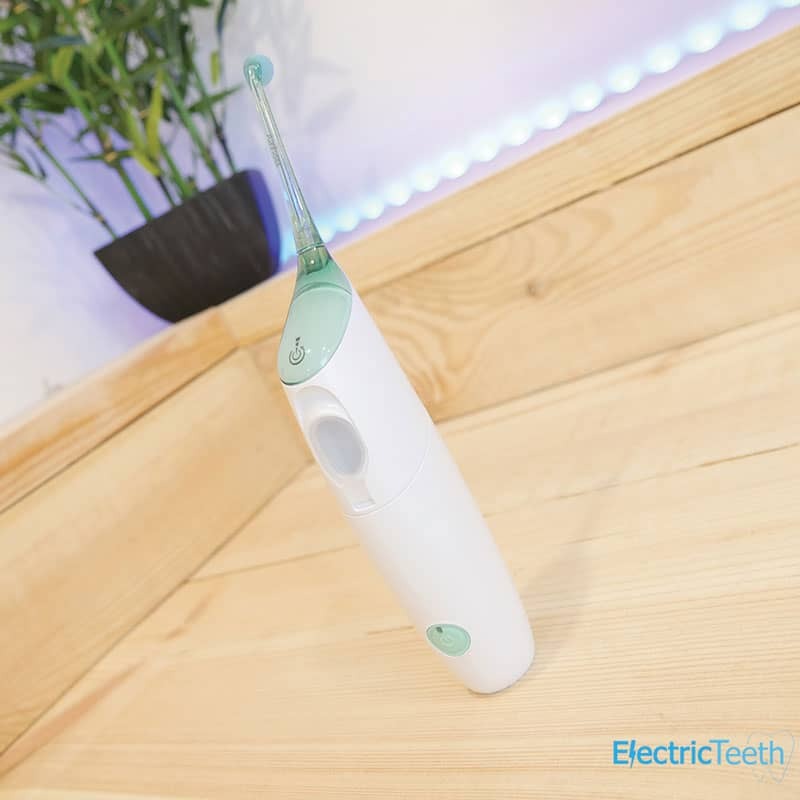 Philips Sonicare AirFloss v AirFloss Pro – What are the differences? There are 2 versions of the Philips Sonicare AirFloss. There is the standard version (view on Amazon) and a newer ‘Pro’ version (view on Amazon). AirFloss Standard in green and white has a model number of HX8211/02 (view on Amazon). 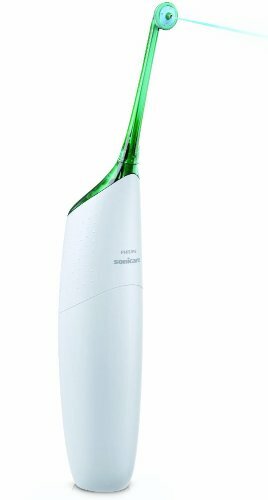 AirFloss Standard in green and white with an additional nozzle has a model number of HX8212/02 (view on Amazon). At the time of writing we were able to find this cheaper than the HX8211/02, despite it having an extra nozzle. AirFloss replacement heads can be purchased here on Amazon. That hopefully clears up any possible confusion between the two models and their variations that are available on the market today. It is the more cost-effective Sonicare AirFloss HX8212/02 model (the non-Pro version) that I am reviewing here. Click here to see it on Amazon for reference. Here are a list of the pro’s and cons having used this for over 6 weeks. Effectiveness – I am referring here to how effective it is at getting me to clean interdentally. It is simple and effortless in my opinion, and you actually want to clean when using this. I can’t say clinically how effective it is at removing floss, Philips would suggest very. Battery life – Lasts up to 2 weeks, which is similar, if not a fraction less than most Philips Sonicare electric toothbrushes. Automatic power off – Whilst you have to power it on, the AirFloss will automatically power off after 4 minutes, which save you having to turn it off and is more than enough time to do what you need to. Size – You get used to the size of the unit, but it is bigger than you expect. Reservoir size – In my opinion it could be bigger. You can complete 2 full flossing sessions before it needs filling. If the marketing and what I have said above is to be believed, then this product is really good and you will not wish to consider anything else. I am not lying when I say I have been really impressed by this product and I really do floss every day with it, but it is not perfect. Initial impressions when taking this out of the box are that it is bigger than you think. Although you know it has to store water, the overall size is quite a bit bigger than an electric toothbrush, but you do soon get used to it. What you can always be assured with when buying a Philips product is quality. From every angle, it looks and feels well constructed and helps you justify the price. It is perhaps a more unusual item to have to store in your bathroom, but it is not unsightly and could potentially share a charging stand with your electric toothbrush. The main body of the flosser contains the battery and the mechanics that allow the flosser to do what it does along with the reservoir for the water or mouthwash. On the body is a clear plastic door to the reservoir where you fill it up and right towards the bottom is the mint green colour power button. Turn the flosser on and off here, the button has a nice tactile feel and will not be accidentally activated very easily. The button also contains an LED which shows the battery status during use and when charging. Once activated you need to press the main trigger button before anything happens. 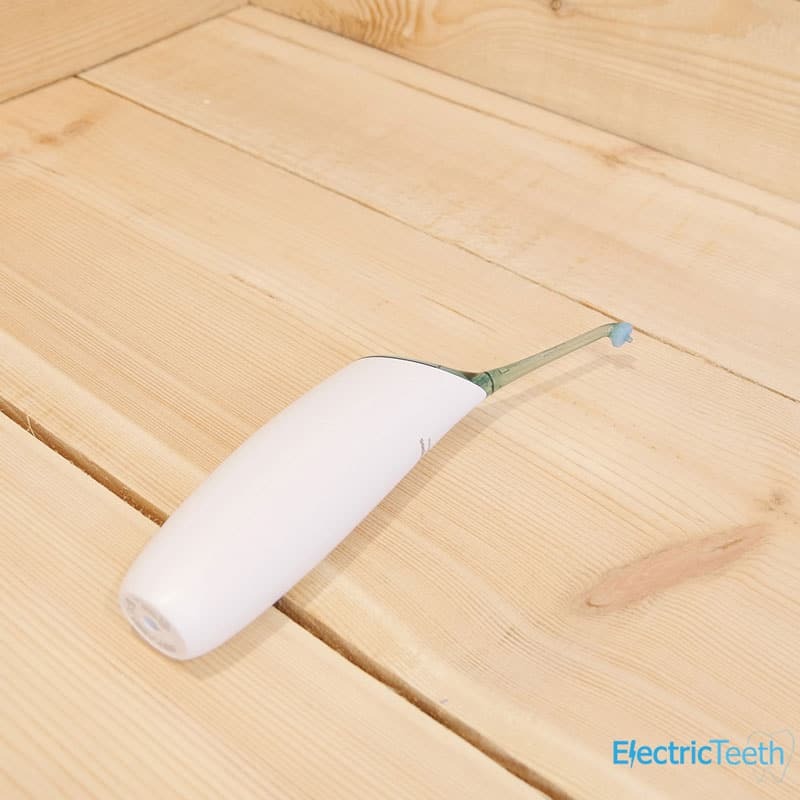 The flosser will automatically power off after 4 minutes to conserve battery power. On the bottom of the unit is a recess into which the prong of the provided charging station sits. At the top of the flosser is where the action happens if you like. A semi-transparent green plastic forms a top to the flosser and this is the trigger. Press it once to fire a jet from the nozzle, press and hold to have evenly spaced jets fire from the detachable nozzle. The nozzle of the AirFloss tip is angled to allow you to hold the unit and have it reach into your mouth. It seems about right in terms of that angle and I could not find any real issue with it. 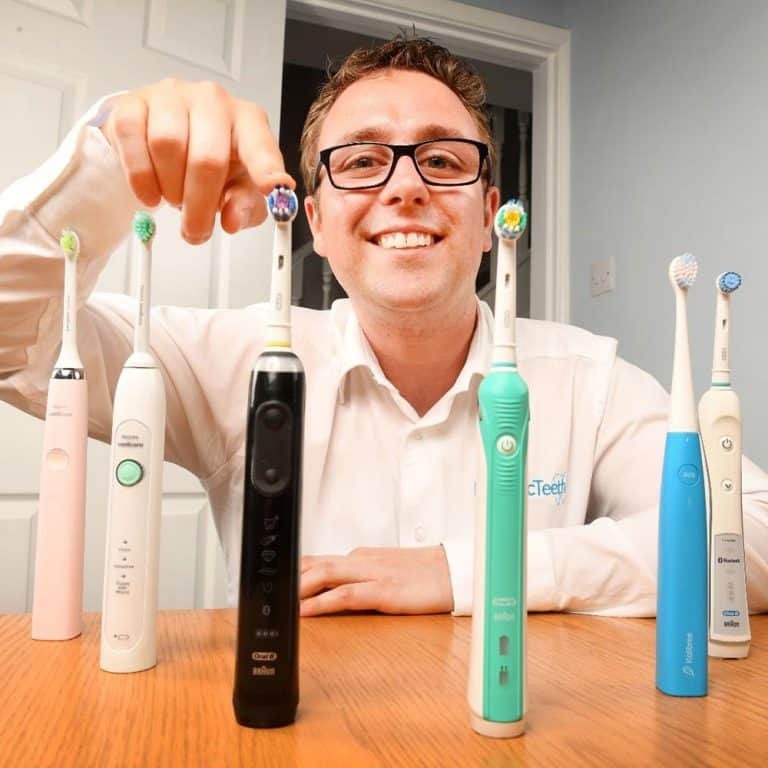 You get about 6 months from each nozzle, you do not need to replace it every 3 months as you do with a normal electric toothbrush head, you get twice the lifetime from the nozzle. I would suggest you may want to have your own nozzle if you are sharing the main flossing unit with a family member. They are simple enough to replace, just pull off, and push back on. It is worth noting that if your preference is for the colour pink, then there is an AirFloss available in a white and pink colour (view on Amazon) combination as opposed to the more common white and green reviewed here. The AirFloss Pro is a white colour with a clear activation button and nozzle. When it comes to actually using the unit, due to its size, you do not get the same comfortable and secure grip as you might with a toothbrush, but this is not difficult to hold nor is it heavy. You can easily find a position that is natural for you to grip and activate the flosser. There are a series of raised dots on the upper front right and left side that your fingers can grip onto. The rest of the body is a fairly smooth white plastic. Suitable for almost any age, the size and the way this needs to be controlled is generally going to be used by adults, but I would suspect any child from about 8 years old would be perfectly fine with it. As the video above has shown the idea is that to complete the floss, you place the tip of the AirFloss unit in between your teeth, approximately 5 or 6mm away from the surface and press the green button on the top to release the high pressure mixture. You then repeat this around the mouth. Once familiar with the process, you can floss in about 30 seconds, if you take advantage of the automatic function. If you press and hold on the top green button, regular bursts will be shot from the tip of the flosser. You get just the right amount of time to move between teeth and position it before the jet arrives. To stop, simply release your hold on the button. Generally speaking, I found I needed only 1 burst per tooth gap, but on occasions, I had another go as I didn’t feel like I cleaned it properly or aligned it incorrectly. There is a certain satisfaction to flossing twice, to make sure the job was done right. This is where the AirFloss Pro differs. There are more settings around the burst options, giving you more control if you feel you want extra bursts you can have up to 3 each time. It will take a few days to get used to using the AirFlosser. Firstly some may find it a little powerful and secondly getting the positioning right. On my first few attempts, I managed to spray the mirror I was stood in front of with the spray that bounced back off my teeth, but you quickly get the hang of it. You will need to do this over the sink, or maybe even in the shower! It is quite interesting to see other people’s reactions for the first time when using it. Maybe show friends and family if you get one, just for a little laugh. It’s an odd sensation initially. After the flossing, you are left with a small amount of liquid in your mouth that you can just spit out. The small reservoir in the handle can hold mouthwash or water, the choice is yours. It is quite a small storage compartment and I found the maximum you will get out of this is 2 flossing sessions before it needs topping up. It holds a maximum of 60ml. This plastic door was very tight and formed a good seal on the unit I was using but I can see this potentially being a weak point. Either the deal will fail or the hinge break. I do not quite agree with Philips statements about the simplicity of filling this up. By no means is it difficult, but you have to be a bit careful from the tap or mouthwash bottle so as not to overfill and end up with a soaked hand and flosser. After a few goes, you find the groove and best way to do it, but I think it is a little awkward, or at least I found it to be far from ideal. Mouthwash does not go off like water can, but personally, if the tank on this thing lasted double the amount of time, I would be much happier. The water is unlikely to be foul if left for 4 days; it is such a small amount. Being picky I may well be, but this is just my 2 cents. Waterpik also create a range of water flossers, which are designed to be much more of a permanent fixture in the bathroom. The Waterpik range are not easy to move about and generally need to be plugged in. The larger water tanks these offer and some more versatility with the nozzles available, not to mention being able to adjust pressure, could be a more compelling solution for some. Despite this annoyance, I love it. It does not come cheap and this could be argued to be a bit of an over the top solution to flossing, but you are more than likely to floss more regularly with this. I thought I had found a good solution in the Wisdom Flosser, but this makes things easier and more convenient, to the point I firmly believe the stats Philips put out that 89% said it was easier than string floss. Probably a psychological effect more than anything is my teeth feel cleaner after the water flosser compared to normal flossing, but that could have been the ‘power’ of the jet making me think this. Another big draw here is that this device is portable, unlike Wisdoms water flossing solutions. As portable as it is, it is much larger than a string floss and does not come with any form of travel case like an electric toothbrush might. As much as I like this product, if I was travelling, this would stand a very high likelihood of not making it into the bag. As I flossed regularly prior to using this, I noticed no sensitivity, bleeding or other side effects. For you, the experience could be different. Sensitivity and a bit of bleeding are normal if you have some signs of gum disease and start to clean between your teeth. If however these issues last for more than a week of daily sue stop using the water flosser and consult your dentist. 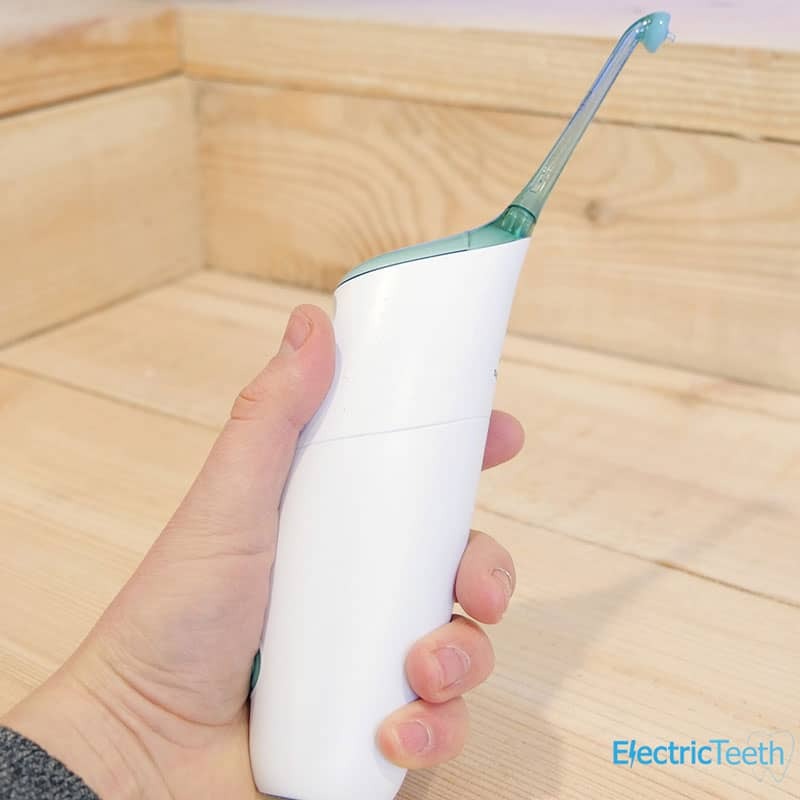 It is probably worth noting that the flosser is water resistant and is protected from splashes, but don’t go immersing it and keep the charging stand well away from water. When you first use an AirFloss you need to charge it for 24 hours. It comes provided with its own charging stand. It is the same as that provided with a Sonicare Electric toothbrush. Therefore if you already have a Sonicare brush you can share 1 charging station for 2 devices. The charging stand itself is white in colour, has a single prong which the flosser sits on and conducts the charge through. When on the stand, it is fairly secure. The charger supports 100-240v and connects to a 2 PIN socket found in bathrooms. You can purchase adapters to use with other types of sockets, such as the UK 3 PIN socket. The multi-voltage supports makes this suitable for international use. When on charge, the LED indicator on the flosser flashes green, until fully charged when it is solid green. Fully charged, the flosser lasts up to 2 weeks, which is great. Press the green power button to turn it on and the LED indicator will illuminate to show powered on. When complete you can turn it off yourself by pressing the button again or the flosser will automatically power itself off after 4 minutes to conserve battery. When depleted or needing a charge, the LED flashes yellow. Similar to Sonicare brushes, this uses a Lithium-Ion battery. At the time of writing the standard AirFloss retails around £55-60* online, although the official RRP is £80. Typically we recommend Amazon as our main buying option, but we have included links to alternative stores below. Click here to view the Sonicare AirFloss on Amazon. The AirFloss Pro retails for £80-£85* and that has an RRP of £100. Click here to view the Sonicare AirFloss Pro on Amazon. Whilst the unit comes with a 2 year warranty, I will use the same calculation that I would with an electric toothbrush and assume the usable life is 3 years. The model supplied with 2 heads is retailing for an average price of £57.50 online, with packs of replacement nozzles costing about £14 per pack of 3, or £4.67 each. Over 3 years the cost of ownership works out at £76.17 or 7p per day. That does not take into account the cost of mouthwash, if you choose to use this. Compare that to string floss at 1-2p per day and it’s about 7 times more expensive, but on a rough par with the highly regarded Wisdom Flosser. Now consider the cost of the AirFloss Pro. Nozzles are about £17 per pack or £5.67 each. The total cost is £110.83, or 10p per day over 3 years. It is, without doubt, a luxury and by no means essential, but the time saved, the simplicity and potential health benefits for many make this a worthwhile investment. *Please note that all costs quoted are approximates and prices will vary based on location, supplier, time of purchase. These figures should not be relied on as hard fact but as a guide, based on real information at the time of writing. Available for £55-60 online (click here to view on Amazon). Available for £80-85 online (click here to view on Amazon). Below we have listed a few different buying options for the various AirFloss products. Not every variant is available from every retailer, so we have included model numbers for clarity. Click here to jump back to the Amazon buying options we listed earlier. The nature of a well used product is that at times they will go wrong, and whilst we hope they won’t but nobody can give these guarantees. We have tested the AirFloss as best as we can and see few weaknesses, the biggest being the reservoir door failing to keep the seal or breaking off. Other reports have suggested the water pump failing and the unit no longer powering on. The good news is Philips do offer a 2 year guarantee on this product, so should it go wrong within that time it will likely be covered under warranty. As best as possible we continue to use all products we test and report back over time if our opinion on each has changed. The small water reservoir is my biggest frustration but it is hardly a big issue. I had thought this would work out more expensive than the Wisdom Flosser that I like so much, but it is about the same price and possibly more convenient. It is expensive compared to normal floss and the real difference between the two in terms of actual cleaning capability; well it’s virtually impossible to tell. That said, I had a dentist check-up during my testing period with the AirFloss and no complaints from the professional’s point of view. A possible frivolous purchase, but if you do not like flossing, if this does not convert you I am not sure what will; the whole process is effortless. This is then backed up by a good battery life. The conscience may still like you use a bit of string floss too for peace of mind and maybe when travelling. I think you get the point; I like this, a lot. The battery lasts up to 2 weeks. Yes, a charging station is included with the AirFloss. What does the yellow flashing light mean? The battery is low and requires charging. How often do the nozzles need replacing? Nozzles should be replaced every 6 months. Can I use mouthwash in the AirFloss? Using AirFloss with mouthwash will enhance your oral health results and leave you with an even fresher feeling mouth. Most mouthwashes can be used in the AirFloss. However, mouthwashes containing Isopropyl Myristate should not be used in the AirFloss as this can harm the plastics in the device and possibly even cause loss of function. How much water or mouthwash does it hold? The charging station has not been designed to be fixed to a wall and should sit on a flat surface. Can I use the AirFloss in the shower? Yes but be aware that whilst the AirFloss is water resistant, it is not designed to be immersed in water if it can be helped. My gums bleed when I use AirFloss. Is that normal? Bleeding gums may be a sign of infection and a little bleeding can be normal when starting a new oral care routine, as you may be cleaning in areas not previously reached. However, if bleeding is excessive or does not stop within a few days of regular use of AirFloss, consult a dental professional. Once a day is advised. Do you own or have you used the Philips Sonicare AirFloss or AirFloss Pro? Are there certain features that you really like or dislike? Let us know what you think about it, and let others who may well be considering purchasing one know your opinions before they do. Thanks for the feedback Rob. I have heard of some others having issues with reliability. It is always difficult to gauge how many people/percentage of users these affect. Having used this pretty much daily for a year or so, I can say mine is still going strong with no faults. I’ve recently purchased the Pro Sonicare and I’m using the mouth wash provided, however, as this mouth wash doesn’t appear to be available as a single purchisable item I’m worried that I may choose a mouth wash that may damage the device. I’ve been advised that Listerine is ok to use and won’t harm the cleaner. What’s your advice regarding safe mouth washes to use with the Pro Sonicare? Here is the link to Amazon, where Philips Sonicare link to themselves as the official place to buy their mouthwash. Sadly at the time of writing it is unavailable. Most mouthwashes can be used in the Philips Sonicare AirFloss. However, mouthwashes containing Isopropyl Myristate and other essential oils should not be used in the AirFloss as they can harm the plastics in the device. Also, do not use concentrated mouthwashes in your Philips Sonicare AirFloss. These mouthwashes are identifiable by their glass or ceramic bottles or containers. Use of concentrated mouthwashes or mouth rinses in the AirFloss can damage the plastics. I use just water in my Airfloss and as I do not work for Sonicare I cannot give you any complete guarantee, but Listerine should be fine given their comments above. Listerine is also very good value normally. I bought one in Feb 2015 and have really enjoyed it. But for no reason it recently stopped working. Not sure if it is a charging issue or something else but it is dead! So is 3 1/2 years normal life expectancy or should I expect it to last longer? Whilst it can vary from one product to another, we would generally suggest that on average products like this will typically last 3-5 years. Some can go on much longer. Great review, but what video says you should keep the nozzle at a 5-6 mm distance from the teeth? I recently bought one, and I’m not sure if it’s better to hold the nozzle against the teeth/gums or at a distance. Philips’ video explaining how to use the Airfloss seems to show the nozzle resting on the teeth. It is ultimately about what you find most comfortable. Holding it a few mm away reduces the force on the gum tissue. This is probably the best, but resting it on the teeth is helpful with lining it up and making for a quick flossing session. Excellent review . I actually am now on my third Air Flosser, my first was bought for £100 an extravagant purchase at the time, thankfully they have become much cheaper. As you may tell I love this product my mouth feels really clean after use. I agree it is very sturdy and yes the plastic hinge on the compartment door can easily break off ( mine did ) . I personally prefer to empty the reservoir after every use, I also wipe it dry- I found moisture left inside can cause the chamber to turn black – mould I think . Leaving water for a few days may encourage this . 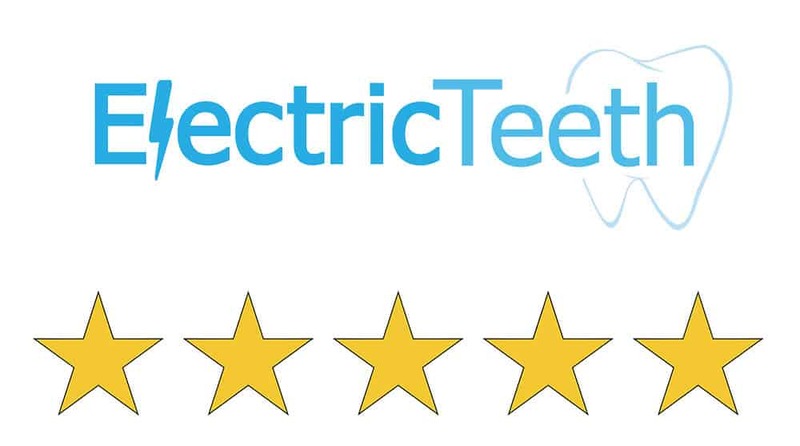 You get a 2 year manufacture guarantee and my first two Flosser’s only lasted the two years, they both had the same problem– I could not press to expel water !! As they were a considerable purchase I was not pleased at the time. However , I would recommend this product and will probably always own one ……. Interesting given you are on your third, that you would still recommend. A testment to the product despite some failings, can’t ask for more than that.